I oftentimes find myself wondering, “How did I get this way?” How did I end up the gore-loving (and relatively normal) weirdo I am today? What things did I consume growing up – whether by television, movies, books, or otherwise – that helped shape and develop my love for the weird, horrific and obscure? I have a ton of fond memories of discovering horror as I got older, but it’s really the darker, weirder, scarier memories that stayed with me and I believe had the biggest impact. 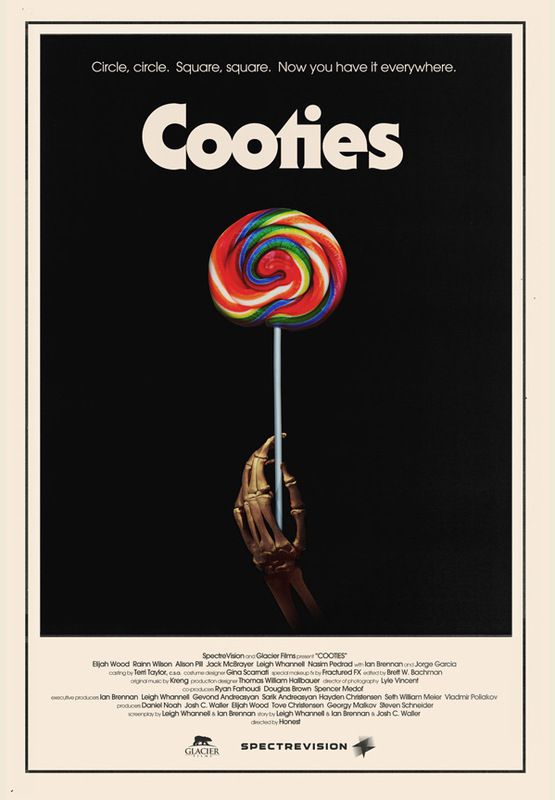 Cooties is an entirely safe, digestible horror-comedy film (more specifically, “zom-com”) that average, passive intakers of horror and comedy will probably enjoy. You know that guy at work, the one who always tells you about new movies you just gotta see — yet you never agree with? He will probably really like this movie and highly endorse it. After all, it’s got that guy from The Office! And zombie kids — whoo boy! More discerning viewers will probably walk away from Cooties feeling nothing at all, no reaction that is positive or negative. 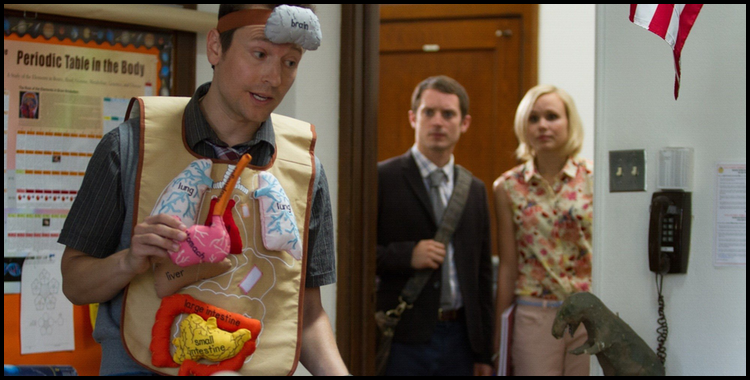 It’s not that there is anything necessarily wrong with Cooties, but there’s nothing particularly right with it either. My ultimate issue with the film is that they took an amusing idea and what could’ve been a subversive, funny movie about zombie kids trying to kill adults — and ended up going a fairly predictable route. To be fair, it starts out really strong: we’re in a slaughterhouse watching chickens be plucked, sectioned, and run through an industrial grinder, churning out that familiar pink slime, the one that made the headlines a few years ago. But this pink slime is streaked with green: some sort of infectious bacteria which has the potential to turn kids into blood-thirsty monsters. From there we cut to a bedroom: a sleeping Elijah Wood is rousted by his mom; it’s the first day of school. Only, Elijah isn’t a student — he’s a substitute teacher. A stalled career in Brooklyn as an author sees him back in his home town of Fort Chicken, Illinois (yes, that’s really the name they chose), living at home with mom and teaching elementary school. There, he reconnects with an old classmate — who is now a teacher, too — as well as a handful of other colorful characters on staff. That toxic chicken meat we saw a few scenes earlier? It’s now in nugget form and being consumed by a little girl at the school. Soon, she turns into a raging zombie, infecting kids left and right, and bedlam briefly ensues. It’s at this point that movie down shifts into auto-pilot: we go from what could’ve been a prime-era Joe Dante or Fred Dekker flick and ease into something more along the lines of something I could see Kevin James or Josh Gad leading. Zomcoms have an unfortunate history with being unable to find balance. Usually, the straight forward “this is simply a zombie movie but with humor” films are the ones that achieve the most success, both with major audiences as well as cult collectives: Evil Dead, Return of the Living Dead, Braindead, Shaun of the Dead — hell, any goddamn movie with the word “dead” in the title. The ones that fail are the ones that get too clever, too angle-heavy: Fido, Life After Beth, Warm Bodies. Unfortunately, Cooties falls into this latter category and unsuccessfully thinks the simple premise of “zombie schoolkids” can carry an 88 minute movie. The funniest characters happen to be the two guys that wrote the movie, Leigh Whannell and Ian Brennan, playing a kooky science teacher and a cocky vice principal, respectively. They feel the most fleshed out and the most unique of the entire cast. And while the always enjoyable Elijah Wood and Alison Pill are well cast as the main leads of the film, everyone else is a one-joke stock character: Rainn Wilson is the macho guy, Nasim Pedrad is the uptight woman, Jack McBrayer is the gay guy. Jorge Garcia is the stoner, and Peter Kwong is the Asian guy. With the exception of Whannell, Wood, Pill, and Wilson, all the other characters barely have a purpose in the movie. They don’t have important dialogue and aren’t necessary to move the plot along or aid in a resolution. They merely exist to perpetuate their one punchline. In the end, Cooties has a hard time deciding what kind of comedy it wants to go for. I laughed out loud once when, early in the film, Rainn Wilson clotheslines a little girl while running from a horde of zombie kids. But most of the humor is uneven and — worst of all — very safe. Interesting ideas — like today’s kids lack of respect for authority and our culture’s current obsession with knowing where our food comes from — are only briefly touched on and quickly abandoned, and instead more focus is placed upon the Asian janitor who knows kung-fu. Cheap, easy, and safe, if you ask me. It’s far from terrible. It’s not just anything, really. I don’t know who it’s aimed at, but if you still pay to see Adam Sandler movies in the theater or think Vince Vaughn/Owen Wilson/Jack Black/Ben Stiller are the apex of comedy, then you will probably love this movie. It does have a killer poster, though.